Flintshire (Welsh: Sir y Fflint) was one of thirteen historic counties of Wales. It was notable for having several exclaves and being the smallest county in Wales. It was a maritime county bounded to the north by the Irish Sea, to the east by the Dee estuary, to the south-east by Cheshire (England) and to the south and west by Denbighshire. The largest of its exclaves, the Maelor Saesneg (the English-speaking Maelor), was bounded on the west by Denbighshire, on the east by Cheshire (England), and on the south by Shropshire (England). 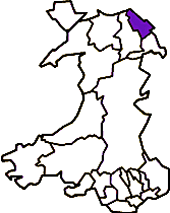 Other exclaves of Flintshire included the manors of Marford and Hoseley, Abenbury Fechan and Bryn Estyn, all on the outskirts of Wrexham in Denbighshire, and also a small part of the parish of Erbistock in Denbighshire. Additionally, a small part of Flintshire, including the village of Sealand, was isolated across the River Dee when its course was changed to improve navigation. The county was formed in 1284 under the terms of the Statute of Rhuddlan and included the cantrefi (hundreds) of Tegeingl, Hope and the Maelor Saesneg formerly parts of the Welsh kingdoms of Gwynedd and Powys Fadog. The Lordships of Mold and Hawarden and also the enclave of Marford & Hoseley were later added to the county. The county town was Mold. Under the Local Government Act 1972, the county and administrative county of Flintshire were abolished, for both local government and ceremonial purposes, on 1 April 1974. 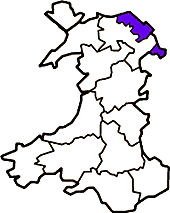 All of Flintshire becoming part of the newly formed county of Clwyd covering the whole of north-east Wales. 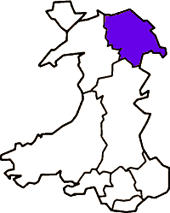 Following further local government reorganisation, the county of Clwyd was itself abolished and the present county of Flintshire was created on 1 April 1996. This covers a substantially different area from the historic county of Flintshire however. Mold continued to be the county town.